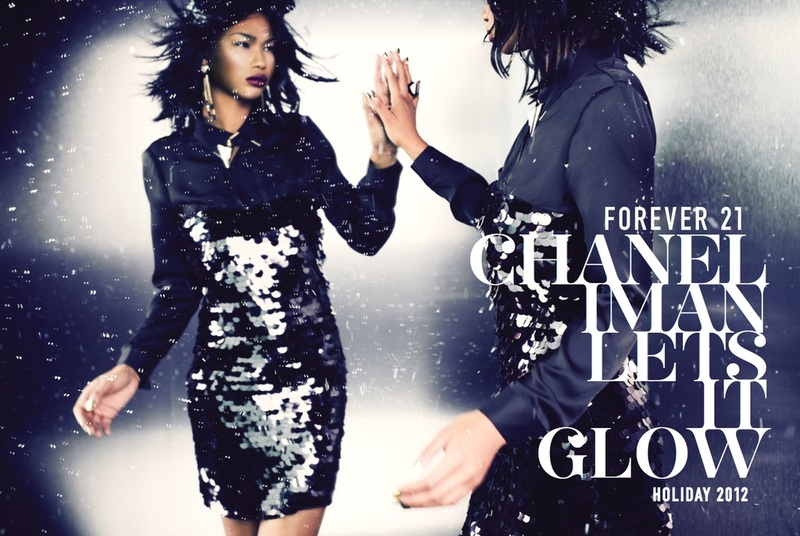 Forever 21 ‘Let It Glow’ Holiday 2012 campaign starring Chanel Iman shows the brand’s holiday offers including sparkly party dresses and ensembles. Sequins are all over the place bringing the festive atmosphere into the looks. Skirts and fancy tops are accessorized with sparkly bracelets, head gear, and cropped jackets. The looks are completed with dressy pumps and festive ankle booties. Trendy belts and gloves also make a statement. The stand out pieces are of cours a fish scales little black sparkly dress with long sleeves and a white ensemble of blouse, skirt and a cropped studded jacket completed with lots of jewelry accessries. Metallic finishes are always in for the holiday season so pick up your finish and color. Forever 21 offers metallics in black, white, and gold.